Back in the day at Manga Bookshelf, I used to write what I called “Persuasion Posts” intended to convince readers why they should invest their time and money on particular series (such as Ai Yazawa’s NANA or Akimi Yoshida’s Banana Fish, etc.). I don’t have a platform suited to this for prose novels (and seriously, by “prose novels” I basically mean “YA fantasy” because do I actually read anything else?) so most of my proselytizing on those books has been in the form of feverish conversations with my teen students and the occasional overenthusiastic tweet. This has generally been kindly received. I’ve successfully gotten some of my teens into favorite authors. Once, Rick Riordan retweeted me. But lately these platforms have simply not been enough. My life’s a bit too crowded these days to put in the time and effort I used to give to those old “persuasion posts” but I’d like to begin using this blog for recommendations now and then. And what better book to begin with than the latest object of my obsession, Sarah Rees Brennan’s In Other Lands . In Other Lands is a book I’m so crazy about that I’ve bought it six times. 1. For my Kindle when it first came out. 2. In hardcover when I realized having it on Kindle was Just Not Enough. 3. For my 15-year-old niece when she was having a rough time at boarding school. 4 & 5. For a couple of my teen students who have enthusiastically followed so many of my feverish recommendations (and I, theirs). 6. A copy for my studio library that can be borrowed by any of my teens. I’d like to think I’m done buying it, but I don’t like to make promises I’m not certain I can keep. Why do I so adore this book that I’d buy it six times? First, its author, Sarah Rees Brennan is a writer whose works I’ve long loved. She has a very distinctive voice that is funny and charming in way that particularly appeals to me to an extent that is difficult to explain. Just as I felt immediately akin and somehow uniquely recognized the first time I encountered the works of Annie Dillard (whose memoir An American Childhood spoke to me as though it had been written by my own childhood imagination), and immediately delighted by the voice of B.J. Chute when I read her novel Greenwillow as a teen, I was immediately charmed and frankly besotted within the first chapter of Sarah’s debut novel The Demon’s Lexicon—a reaction that has only increased with her subsequent work. Some writers just get you, and for me, Sarah is one of those special few. It is finding authors like these that convinces me of the vital role of storytelling in showing us how we overlap with each other, not just in the physical world, but in our secret, inner selves. It’s what makes us feel that we’re not alone in the world, and that there’s a point to it all. Why do I encourage other people to buy this book? It’s a truly epic tale somehow contained in a single volume that both parodies “schoolgirl/boy/person in another land” stories while becoming a beautiful, compelling example of same. It’s got a queer protagonist in a genre that really needs many more. It’s charming and freaking hilarious, while also being dramatic and moving at just the right points. It was my favorite new YA fantasy novel in 2017. And it’s not just me! 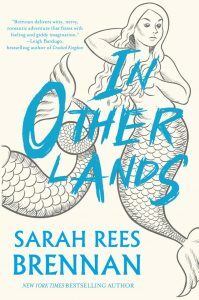 In Other Lands is a finalist for the Award for Best Young Adult book at the Hugo Awards this year, and I could not be more thrilled to see Sarah getting the attention that is, in my view, long overdue. You can find Sarah talking about the unusual journey of this book here in her blog. You can buy it for a really great price at Amazon here . You can check out her other books, which are all honestly fantastic here. I highly recommend it all.